Did you know that February is National Snack Food Month? I didn’t either, which is why I’m covering these snack foods in April. Boom! I’m always looking for snacks I can take with me — snacks that, even if I forget them in my bag for a few days (or okay, weeks), won’t ruin my bag (thanks, banana). So when these two salty snacks landed in my inbox, I had to take them up the offer for samples. I love a good beef jerky or fuzzy heart-shaped box of beef jerky, and chips have been calling my name since salt became my best friend in early pregnancy. Read on for what I thought of these two salty snacks. Available in four flavors including Sea Salt, Barbeque, Nacho and Jalapeño Lime, Rhythm Superfood Chips are non-GMO, gluten-free, vegetarian, and kosher-certified. They’re baked and filled with a blend of vegetables, exotic superfoods (such as quinoa, amaranth and purple corn — ooh! ), pea protein and spices for a chip that’s healthier than your standard potato chip. I tried the Sea Salt and Barbeque varieties. I love how you can see the seeds and grains in the chips (barbecue on the right and sea salt on the left). They also have a satisfying baked crunch and hearty flavor. The barbeque is salty and a little sweet, while the sea salt version tastes wholesome — in a good way. A 28-gram serving size (5.5 per bag) will give you 110 calories, 3 grams of fiber, 4 grams of protein and just 1 gram of sugar for each of the varieties. Overall a healthier sub for the chip that won’t leave your hands greasy! 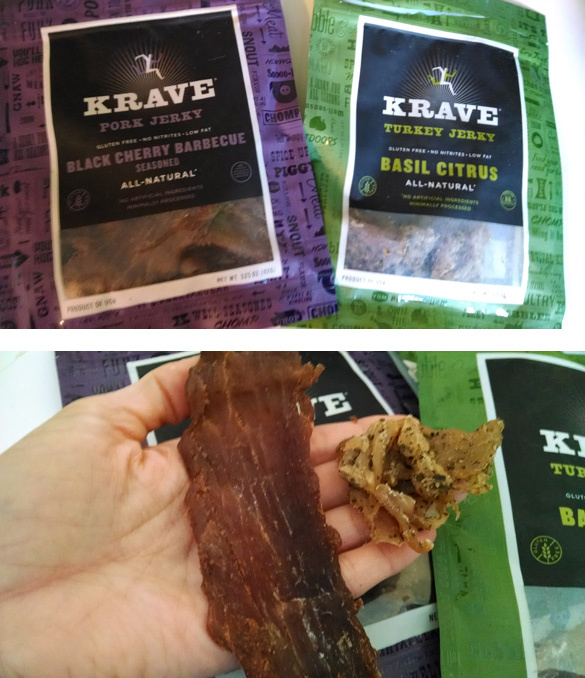 KRAVE Jerky is a fancier version of your standard jerky. The artisanal brand offers gluten-free, high protein and low-calorie beef, pork and turkey jerky. Starting at only 70 calories per serving and made using high-quality ingredients, it’s a protein-packed snack. Interestingly, when I went to snap photos of the jerky, the beef version was missing. I blame the jerky-loving husband for that one, but I can vouch that it was tasty (and its absence probably tells you the same thing). The Black Cherry Barbecue Pork Jerky (left) and the Basil Citrus Turkey Jerky (right) and the missing beef were surprisingly moist for jerky. Not in a wet way — just in a less dried-out way. The black cherry barbecue was my favorite — it had a sweet flavor to it, while you could definitely get the citrus vibe from the turkey. The kids loved to taste-test them, too.